Take the Guesswork Out of Hiring B2B Sales Professionals and Sales Managers! 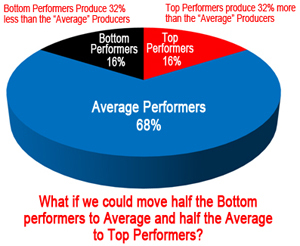 Sales people tend to fall into three groups of STARS, SOLID PERFORMERS and PASSENGERS. We are expert in spotting the stars and avoiding the passengers! If your sales manager is spending too much time with passengers just getting them to be average we can change that! The answer is inside your people. If your sales manager is hanging on to underperformers too long we can fix that and avoid 50% of those mistakes in the future! We assess your top and bottom and will show you what is different so you can measure that before you hire! Like a sports coach looking at the game films of wins and losses, you will be better able to spot talent and avoid time-consuming, energy-draining underachievers! Cut costly hiring mistakes by 30% to 50% and hire Top Performers the first time! What level of cognitive agility is critical to sales success? Is there a cut off? Does the candidate have the stamina, confidence, discovery and energy for the job? How passionate are they about sales? Will they make the extra call or work a Saturday? Discover the answer inside your top sales people and inspect what you expect before you hire! The answer is right in front of you and we will show you in a differential study.! Call us for ideas and solutions that will impact your sales in the next 2-3 quarters.